Congress will provide a statutory basis to the National Security Council (NSC) and the office of National Security Adviser (NSA). The key to internal security is intelligence, analysis and quick response. Congress had put in place the Multi-Agency Centre and the NSG regional hubs. Congress had also proposed to establish the National Counter-Terrorism Centre and NATGRID. Congress promises that NCTC will be set up within 3 months and NATGRID will be made operational by December 2019. The most serious threats to internal security emanate from (1) terrorism, (2) infiltration of militants, (3) Maoism or Naxalism and (4) caste or communal violence. Congress believes that each of these threats deserves a separate and distinct response. Congress promises to immediately withdraw the Citizenship Amendment Bill and to restore the special category status of the seven states in the North East. Jammu & Kashmir: BJP reiterates our position since the time of the Jan Sangh to the abrogation of Article 370. We are committed to annulling Article 35A of the Constitution of India as the provision is discriminatory against non-permanent residents and women of J&K," the BJP manifesto reads on Article 370 and 35A. It also promises to make all efforts to ensure safe return of Kashmiri Pandits. 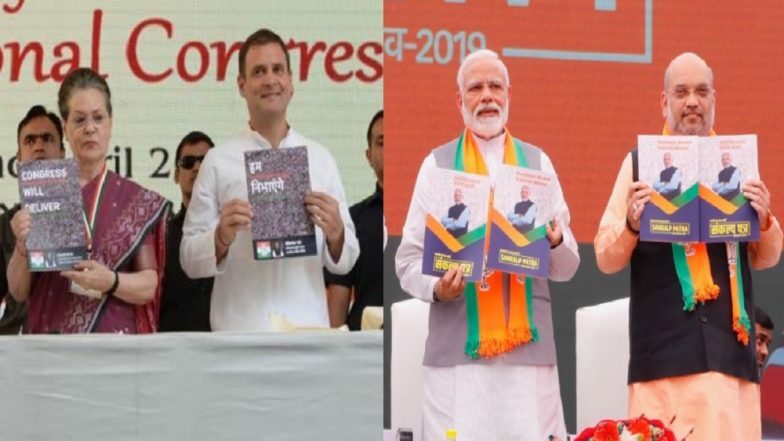 Surgical Strikes: The BJP manifesto mentions the surgical strikes to say, “We will continue to follow our policy of giving a free hand to our security forces in combating terrorism”. Congress promises to establish a National Council on Foreign Policy which comprise of members of the cabinet committee, national security experts and domain experts -- will be set-up to advice the government on its foreign policy. Congress says it will “persuade other countries to compel Pakistan to verifiable end its support to terrorist groups that it shelters”. It also promises that it will work towards engaging more with the United Nations to constantly review its terror financing and sanctions list. Congress said it would work in close coordination with neighbouring countries, including Sri Lanka and Pakistan, to sort out issues of conflict when it came to the arrest of fishermen for moving in the other country’s territorial waters. BJP says it will increase ways to facilitate knowledge exchange and technology transfer internationally. Both parties have put down a long list of promises and many of these promises are not new. Only the results of the Lok Sabha elections 2019 will tell in which direction India’s national security and foreign policy will now move.